Link to Doug Stephen’s images from Lahti. Of the four Russian athletes starting the 15-kilometer classic mass start in Lahti, Finland three placed in the top four. Anna Zherebyateva won in 40:31.4 minutes as she was able to stretch her nine-second gap at 10 k to 23.5 seconds by the finish. Also from Russia, Lidia Durkina placed second (+23.5), Germany’s Katharina Hennig skied to third (+37.5). Yana Kirpichenko was the third Russia in the top-five as she placed fourth (+41.6). 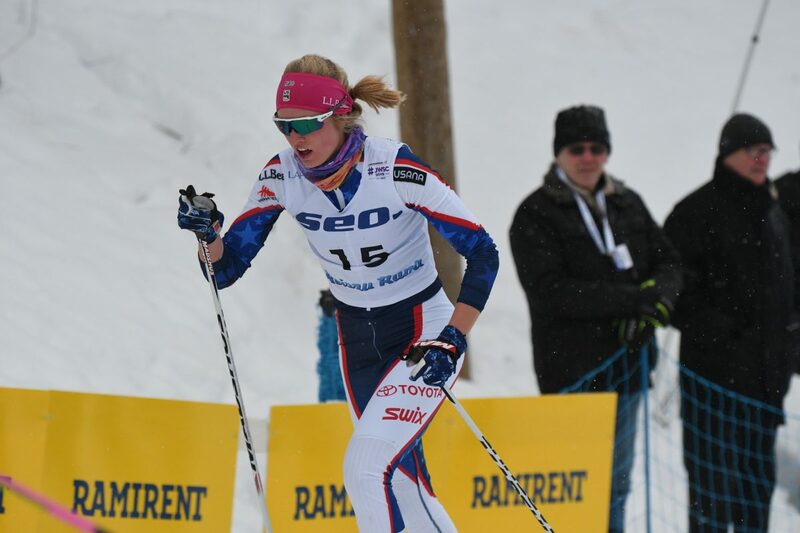 The best North American finisher was U.S. skier Hailey Swirbul who raced to 10th (+1:27.8). Swirbul was positioned 29th at the 5 k time check but steadily moved up in the field as the race progressed. By 10 k she had positioned herself in the top-15. For the twenty-year-old Swirbul, this is her first go at U23 Worlds after participating in three Junior Worlds as an U20. Last season in Goms, Switzerland she placed second in the 5 k classic and third in the 10 k skiathlon. Two other U.S. skiers raced into the top-30. Julia Kern placed 16th (+1:43.4), while Alayna Sonnesyn was 23rd (+2:24.9). Hannah Halvorsen, the fourth U.S. starter, placed 54th (+6:58.6). Hannah Mehain was the top Canadian in 31st (+3:16.8), Sadie White placed 33rd (+3:18.6), and Natalia Hynes 51st (+3:40.9). Marie Corriveau did not start. Similar to the U23 women’s race, Russian skiers dictated the pacing at the front of the pack — the four Russian starters swept first through fourth place. Andrey Sobakarev won in 1:17:19.1 hours, Ivan Kirillov placed second (+3.5), Ivan Yakimushkin third (+4.9), and Anton Timashov fourth (+11.4). 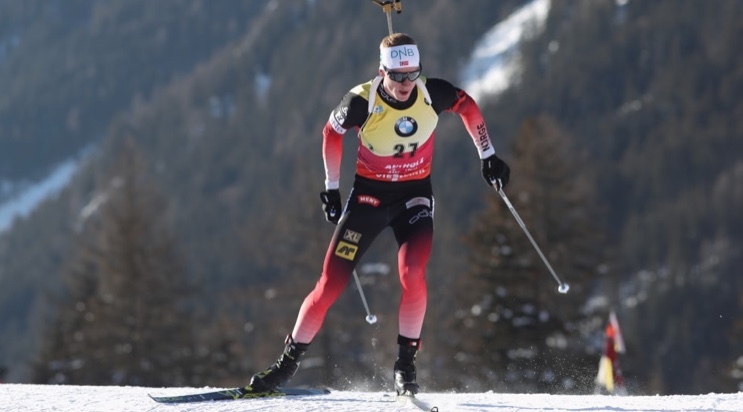 Canada’s Antoine Cyr was the top North American in 27th (+2:26.8), while teammate Gareth Williams toed the line a fraction behind in 28th (+2:26.9). Also for Canada, Ritchie Graham was 41st (4:44.1), and Julian Smith 45th (+5:14.3). Peter Holmes was the top U.S. finisher in 33rd (+3:15.7). Hunter Wonders placed 40th (+4:43.0), Braden Becker 53rd (+6:59.0), and Daniel Streinz 66th (+15:53.9). In the groove is in the groove. Norway’s twenty-five-year-old Johannes Thingnes Bø scored his 10th IBU World Cup win of the season today in the 10 k sprint in Antholz, Italy. Bø won the race in 23:53.9 minutes with a single penalty in standing. The Norwegian leads the IBU World Cup overall and padded his lead with his fifth sprint win this year. Bø’s season thus far has been a study in speedy skiing. His shooting stands at 87% for accuracy (82% standing, 91% prone) with his superior skiing speed carrying him to the World Cup overall lead. In Antholz today, his course time for each of his two 5 k laps were ranked first. Norwegian teammate Erlend Bjøntegaard shot clean in both his shooting bouts to take second place, 17.5 seconds behind. France’s Antonin Guigonnat placed third (+20.2, 0+1). Scott Gow of Canada was the top North American in 20th (+1:06.6, 0+0). Teammates Jules Burnotte raced to 48th (1:55.9, 1+1), Christian Gow 61st (+2:13.4), and Aidan Millar (+3:46.7, 2+2). Jake Brown was the top American in 40th (1:42.4, 1+0). Sean Doherty finished in 55th (+2:06.2, 2+1), Max Durtschi 62nd (+2:13.8, 0+1), and Leif Nordgren 73rd (+2:43.1). Racing continues tomorrow in Antholz for both the men and women with the 12.5k and 10 k pursuits. In the 5 k-freestyle individual start Jessica Yeaton (APU/Australian National Team) placed first with a winning time of 15:01.9 minutes. She was in a tight race for the top spot with U.S. Ski Team/SMS T2 athlete Sophie Caldwell who finished 3.0 seconds back. Caldwell is back home in Vermont training and preparing for the 2019 World Championships. Katherine Ogden (Dartmouth Ski Team) placed third in a time of 15:17.8. Kelsey Phinney (SMS T2) placed fourth in 15:37.7. “Today’s race went super well for me; I had awesome skis despite tricky conditions/weather leading into the race – our wax tech did a phenomenal job,” Yeaton wrote to FasterSkier. “The course here is really good for me with all the steady climbing in the first part- I just tried to push hard to the top of the course and then survive and carry my speed on the downhill, which turned out to be a good tactic. Kyle Bratrud (SMS T2) won the men’s 15 k skate in 25:27.1 minutes. Bratrud, who was recently selected to the 2019 U.S. World Championship Team, has been a top-performing distance skier this season on the SuperTour. Bratrud recently won the NorAm/SuperTour 15 k classic in Sovereign Lake and the 15 k classic at U.S. Nationals. Bratrud placed second in West Yellowstone’s SuperTour 15 k skate, and the 30 k skate mass start at U.S. Nationals. Akeo Maifeld-Carucci (CGRP) placed second in a time of 26:18.9. It was Carucci’s second SuperTour podium of the season and his best career SuperTour result. In West Yellowstone, he was third in the 15 k skate behind Ben Lustgarten (CGRP) and Bratrud. Alexis Dumas (CNEPH) of Canada was third in 26:32.2. U.S. skier Adam Martin was fourth, 3.1 seconds behind Dumas.